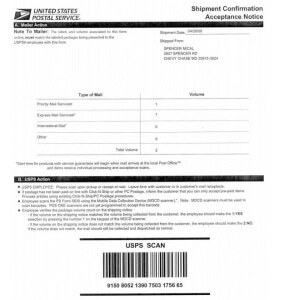 The USPS Shipment Confirmation Acceptance Notice, known as a SCAN Form, is a piece of paper with a master barcode that includes all the packages associated with a group shipment. At the time of pick-up, the USPS employee scans the barcode on the SCAN form to disseminate tracking info for all the packages rather than scanning each package individually. This single step saves a lot of time for USPS employees. When the barcode is scanned, the package information is instantly transmitted into the USPS tracking database, notifying both shippers and recipients that their shipments have entered the USPS mailstream and that the shipping process has started. After being scanned, shippers and package recipients can track and check the status of their packages using the USPS Tracking number. How to use a SCAN Form? SCAN Forms are available for any customer who prints shipping labels via an online postage vendor. When using a SCAN Form, all packages must be shipped the same day the shipping labels are printed. Also, each package can be associated with only one SCAN Form. SCAN Forms must be used in conjunction with electronic USPS Tracking or electronic Signature Confirmation, otherwise they cannot be used. To ensure package information is not duplicated, updates or changes cannot be made once a SCAN Form is printed. Examples of an update or change include adding or removing packages associated with the printed SCAN Form. If you make an update or change, your SCAN Form is no longer valid and all packages associated with that form must be scanned individually. Stamps.com makes it easy to print SCAN Forms. Simply print all the shipping labels at the end of your business day, select the appropriate packages within the software, then print the SCAN Form (before 9 pm local time). 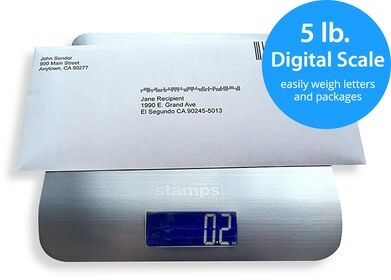 The Stamps.com software will instantly submit your package information to the USPS. After the SCAN Form is printed, you may bring all your packages and the SCAN Form to the post office where the carrier will scan the barcode on the form or you may leave the packages with the SCAN Form for your local carrier to pick up.